Dedicated mobile app for divorced parents who seek a fair recognition of their child raising efforts. See how your custody schedule coincides with holidays and events stored in your device calendar. Log pick‑ups and drop‑offs. Add photos and PDF files. Control the timeshare percentage, total hours and overnights. Log parent‑child calls (date, time, duration), including unanswered calls. Track due and paid amounts. Add receipts. Export data to Microsoft Excel. Document deviations from the established visitation agreement or parenting plan. Create easy-to-read reports containing color-coded calendars and send them to the other parent or your lawyer, or submit to the court. Schedule and track parenting time. Monitor compliance with your custody agreement. Log dates and times. Add notes, photos and PDF attachments. Simulate your child visitation schedule using recurring events. Generate detailed visitation calendar reports. Track expenses for multiple caregivers and children. Define recurring payments and set reminders. Track due and paid amounts, indicate disagreements. Document expenses by adding notes, photos and PDF files. Court ordered communication via telephone or video chat is a standard provision in many states. Use Alimentor to keep a history of parent‑child calls (date, time, duration), including unanswered calls. Store contact details for each child. Initiate calls directly from the event editor. Log successful and failed contact attempts. Monitor the gap between scheduled and actual: timeshare percentage, hours, overnights, expenses. Concurrently log planned and actual: parenting time and expenses. Document deviations, missed visitations and past due payments. Store emails and other documents as attachments in PDF format. Visualize how your parenting time aligns with holidays and events stored in your device calendar. Report scheduled and actual parenting time in the same calendar. See at a glance the duration of events thanks to color-coded bars. Use external and built-in holidays calendars (US, CA, AU). The term “best interests of the child” refers to the deliberation that courts undertake when deciding what type of services, actions, and orders will best serve a child as well as who is best suited to take care of a child. “Best interests” determinations are generally made by considering a number of factors related to the child’s circumstances and the parent or caregiver’s circumstances and capacity to parent. Use Alimentor to tag your records with the “best interests” factors and generate the “Best Interests of the Child” report. Give this document to your attorney to minimize the time needed to prepare a legal brief. Create easy to read reports (.pdf) containing color-coded calendars and send them to the other parent or submit to the court. Edit user settings to adjust the layout of the report to your individual needs. You can also export your data to a spreadsheet file (.xlsx) in order to perform some advanced calculations or to create charts. Avoid accidental data loss when your device is lost or damaged. Sync data across your own devices. Share data with other Alimentor users (read‑only). I’ve been using this app since the day I split with my ex. It was invaluable when I needed to renegotiate child support based on actual time spent. I was able to show every hour I spent with my child. Excellent tool for any dad! Very simple and user friendly! Helps keep track of all time and expenses. Worth the purchase price to be able to export data and log changes within seconds! I love this app. I don't think you can find anything like it in the App Store. Makes documenting a breeze. I transferred my data from a spreadsheet to this app and instantly got % parenting time and silenced my ex's lies. I will keep using the app to document everything! Also I had a few questions and the developer responded to me very quickly! Thank you! For those who have that problem with their Ex who is always placing blame and is untrustworthy, well this is the perfect tool!! Document, document, document!! In court it's always “he said versus she said”, well this app will help you keep track of all the receipts for clothes, shoes, diapers, child support payments and etc. (…) Good luck to those of you who are in similar situation like mine! App keeps track of parenting time and expenses without needing a monthly subscription like other websites or apps. Easy to use. Customizable reports. Worth the money. After a crazy divorce this is the perfect tool to keep records. Especially after my ex is trying to say he is getting time that he isn't. Thank you for this app!!!! This app is everything you need in case you find yourself litigating with your ex in court for custody or child support. Since in California child support is calculated based on real parenting time, everything you need to do is to print out your calendars with parenting time/percentage from the app and attach it to your declaration/motion/RFO. Worked well for me. Love this app. User friendly and creates very useful reports. I'm an attorney and practice family law and I use this to track visitation etc with my ex. I also recommend it to clients who need to track custody time. You can start by tracking past events. Log visitations and expenses (including receipts). Add photos. Store emails and other documents as attachments in PDF format. After a few weeks start analyzing your timeshare percentage and spending. Read what you have collected and decide if there are any insignificant records that you can remove. Decide what record titles work best. Short, generic titles usually let you better categorize your records. Then determine if you are ready to share your data. You can ask the other parent to install the app and use Alimentor sharing features, or simply begin to regularly send PDF reports. Use the collected information to develop a regular custody schedule and agree how you will split child raising costs. Reading Alimentor usage tips will help you efficiently use the app from the start. Use recurring events to model your regular visitation schedule. If you allow Alimentor to access your device calendar, you will be able to see how your custody schedule aligns with holidays and other important family or business events. Once your Alimentor calendar setup is complete, review upcoming months and discuss with the other parent how you can reschedule conflicting visitations. Try to work out rules for planning holidays. When editing individual planned visitations, always check how these changes affect your timeshare percentage. If you are not using Alimentor sharing functionality, then once every few months generate a long term report containing planned visitations calendar and send it to the other parent. Use iCloud calendar subscriptions to subscribe to a state specific holidays calendar. Add recurring expenses to monitor your bills. Establishing a realistic parenting agreement can be challenging. Ensuring compliance with it is usually even a more tedious task. Regularly generate and send Alimentor reports that list and summarize all discrepancies. If you decide to renegotiate your parenting plan, consider exporting your Alimentor database to a spreadsheet and preparing dedicated statistics. Writing down your child raising efforts is a deeply satisfying activity. Become more organized. Assess better whether or not you are working towards your goals. Minimize the time needed to prepare a legal brief by generating the “Best Interests of the Child” report. Stay organized and encourage your lawyer to effectively represent you. Multiple PDF documents and photos can be added to a single data record (up to 5 MB). Documents can be added using iOS Document Picker or Universal Clipboard. Generated reports can contain attached documents. New chapter: “Best Interests of the Child”. User selectable layouts: Actual, Scheduled, Actual vs. Scheduled. Scheduled and actual parenting time can be output in the same calendar. Calendars now display event titles and can contain events from selected device calendars. New record type “Call” for logging call history. 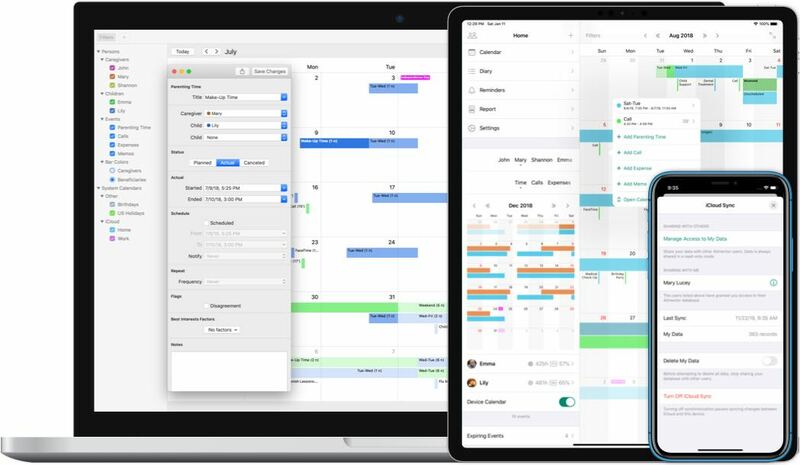 Quicker calendar navigation, faster search, simplified timeline, improved preview. Parenting time records for the same caregiver and child can overlap. Enhanced settings for creating recurring events. Alimentor 2.1.7 is available for iPhone and iPad, requires iOS 11.1 or later. Have a question, suggestion, or problem? We're here to help. All rights reserved. Copyright © 2013-2019 Tomasz Domański.